After trying to make my blog into a 2nd job with hopes of making some extra cash with giveaways & ads, I've decided to go back to what matters. Documenting the ups & downs of my adorable little boy in my journey through mommyhood. I LOVE writing about little E, but I hated all the time I was spending in front of my computer instead of cuddling him. 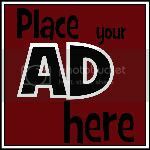 So here I go, blogging because I want to, not to make money. Little E is now 1 year, 1 month, 14 days, 13 hours, & 24 minutes old. I like to be specific. His interests include screaming, running in circles, climbing & jumping off EVERYTHING, giving kisses as he reaches for whatever you have, banging things together, playing with anything that makes noise or lights up, & fake crying for attention. He's the sweetest, funniest, cutest little person in the world. I'm so blessed to have him. He's pretty amazing. It's been a while since my last post. I guess you could say little E has been keeping me busy! He's almost 10 months old, which is insane. I refuse to let him grow up (like I have a choice...). I've also been working on starting a little on the side hobbyish photo business, which takes up a TON of time. I'm not really starting it to make money, but rather as a way to pay for all the photography related costs since Luke's recent job change made money a bit tighter. Eli has become a full on pro at standing, & I know it won't be muc longer before walking becomes his favorite means of travel. He can take a few steps, & has been for about a month, but he doesn't have it down quite yet. Tomorrow we go in for E's head scan. I'm trying my best to stay optimistic about it, but can't help but be scared to death. He seems fine, no obvious developmental issues or anything, but his head is growing at an alarming rate. He's been above 99% on the charts since he was born, but now it keeps jumping up. As nervous as I am about tomorrow, I'm also relieved for the day to finally be here so we can all stop wondering. A year ago I was anxiously awaiting Eli's arrival, now I'm starting to look for his first birthday invitations. A year ago I was wish time would pass quicker, now I wish I would have been a little more patient & cherished each moment. A year ago I was buying newborn sized clothes for my unborn baby, now I'm chasing an 8 month old around. Thinking back on where I was a year ago makes me realize everything I have learned as I became a new parent. When everyone tells you to enjoy your time before the baby is born, do it. Just take some time for yourself, because those moments will soon be fleeting. You won't ever be a 'perfect' parent. There really is no such thing. It's no longer a big deal if your normally spotless house is a bit messy, it's more important to cuddle with your baby while you still have the chance. The toilet will still need scrubbed tomorrow, but that sweet baby is growing up before your eyes. Be patient, relax, & enjoy the moment. When you're waiting for your baby to be born, when your ready for bed but your new baby isn't, & when you can't wait for your baby to reach his next milestone. You'll miss that moment one day & wish you hadn't rushed it away. You will save a TON of money by using cloth diapers. They really aren't that hard. Save a little time for yourself. You are not a bad parent if you want an afternoon to yourself. You are only human. Ask for help, you are not super mom. Your baby doesn't need 100 newborn or 0-3 outfits. The can all be washed & worn again. Return a few for some bigger sizes, you'll need them later. While you want to be educated on what is best for your baby, being paranoid & overly cautious is not necessary. Money doesn't matter to your baby. As long as he has the food he needs, a safe place to sleep, & a loving family, he has everything he needs. Fancy toys are not necessary & he will probably enjoy the box it came in more. Take LOTS of pictures. You will soon be shocked by how tiny your baby once was, & will regret not taking more pictures & videos of him at each stage. Make back ups of those pictures! Just in case the terrible happens, make a back up & keep it in a safe place (like a fire proof, water proof safe). Losing all those images will make you sick. Be thankful for the beautiful baby you hold in your arms every day. My son means the world to me & I can't wait for him to teach me more & more everyday. I am blessed to have such a sweet little boy. Lil Bundle of Joy Giveaway Winner! 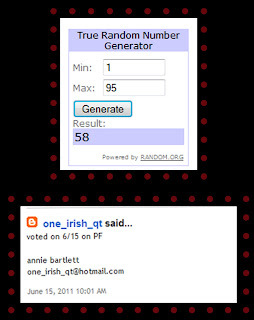 comment # 58 posted by one_irish_qt! The winner has been contacted & will have 48 hours to respond. If they do not respond within 48 hours, a new winner will be drawn. I couldn't do a chin-up to save my life. But Eli? Well, he's kind of starting to become a pro at chin-ups. Everytime I turn around he seems to be hanging from something. If he's hungry he'll hold on to his high chair & let his legs dangle below. If he wants in his bouncy horse, he'll hold on & kick his feet. If he wants on the couch, he'll hold on tight & pull up his legs while he attempts to scoot on. This all makes me so nervous. I never let him dangle long enough to see if he'd just let go, but I'm terrified Daddy won't be paying close enough attention & he'll fall & get hurt. I never knew how much my little boy would terrify me....but it does. Why must insurance be so EXPENSIVE?!?!!? My husband lost his job last week, so we all lost our insurance. Luckily, he has already found a new job, but they don't pay anything for dependents insurance coverage & his won't start for 90 days. I'm able to get back on at my work, but to add Eli it's $300 a month & to add Luke it's $250, on top of the $160 I pay for mine! So, I started my search for more affordable insurance for Luke & Eli. The cheapest good plan is $307 for both of them. Which is what it would be to add Eli to our work plans, so I guess it's really all the same, but this way I don't have to worry about them losing insurance if he loses his job again. I guess paying $467 isn't too bad when I consider how expensive everything can be if something happens; but it is still more than is easily affordable for us, especially considering Luke took a pay cut with his new job. I suppose I should be a little more thankful that we are able to afford insurance at all. But I still hate parting with almost $500 a month, I keep thinking of all the debt we could be paying off. Oh well, life happens right? My son is absolutely perfect. He loves hugs from his Momma. He kicks & squeals in excitement when he sees his Daddy. He loves squealing & screaming, especially at the dogs. He likes his sleep, almost as much as Mommy. He loves to eat, I hope he won't grow up to be as picky as his Daddy. He will crawl to what he wants, unless he knows your watching him. Then he'll scream 'til you do what he wants. He has learned how to climb into his carseat. He could jump in his jumper most of the day. He has discovered how to pull himself up on furniture. He loves banging toys together, because the noises they already made weren't loud enough. He loves the water. I'm starting to think he may have gills somewhere. He gets excited when you let him walk while he holds onto your fingers. He can hold his bottle, but won't do it because he knows you will hold it for him. He loves his little race track. If we could figure out a way for him to play with that while jumping, he'd never do anything else. He knows he has his Mommy & Daddy wrapped around his little finger, but we wouldn't have it any other way. My sweet little Eli can make a terrible day better with just one smile. And nothing beats those sloppy baby kisses. It's hard to think that I met him for the first time only 220 days ago. Even with all the dirty diapers, screaming fits, & sleepless nights, it has been the best 220 days of my life. When I was younger I loved harvest. I loved how the wheat looked when it was ready to harvest. I loved how it meant nice, hot weather. I loved all the cute farm boys I'd see all over town. I loved combine & tractor rides. I loved everything about it. I never understood how someone could hate harvest. But now, I get it. I have become a harvest hater. I still love the way the wheat looks, the beautiful weather, & the combine & tractor rides; but now, I'm married to that cute farm boy. Now I'm sitting at home with our baby, wondering if he'll get home before we go to sleep. Chances are, he won't. But probably I'll catch a glimpse of him as he leaves in the morning for work. Not quite the life I imagined as a teenage girl in love with harvest. Lil Bundle of Joy Review & Giveaway! When I found Lil Bundle of Joy on Etsy, I instantly fell in love with EVERYTHING in the shop! They have all sorts of adorable things; from little plushie & crinkle owls to bibs & burp cloths. I choose a boy plushie owl & a crinkle owl to review. I couldn't wait for them to arrive. They are so adorable & I just knew Eli would love them as much, if not more than I do! Boy was I right! As soon as they came in the mail I ripped open the package, gave them a quick check over to be certain I was comfortable with Eli playing with them, & then handed them to Eli. He was immediately intrigued. He kept crinkling the yellow crinkle owl & giving the red plushie kisses, smiling & laughing the entire time. We left for vacation the next day & I'm so glad I had them! The crinkle owl kept him entertained for quite a while on our 22 hour drive & he loved to snuggle the plushie! If you have a little one, I am convinced they will like these little toys as much as my little guy did! 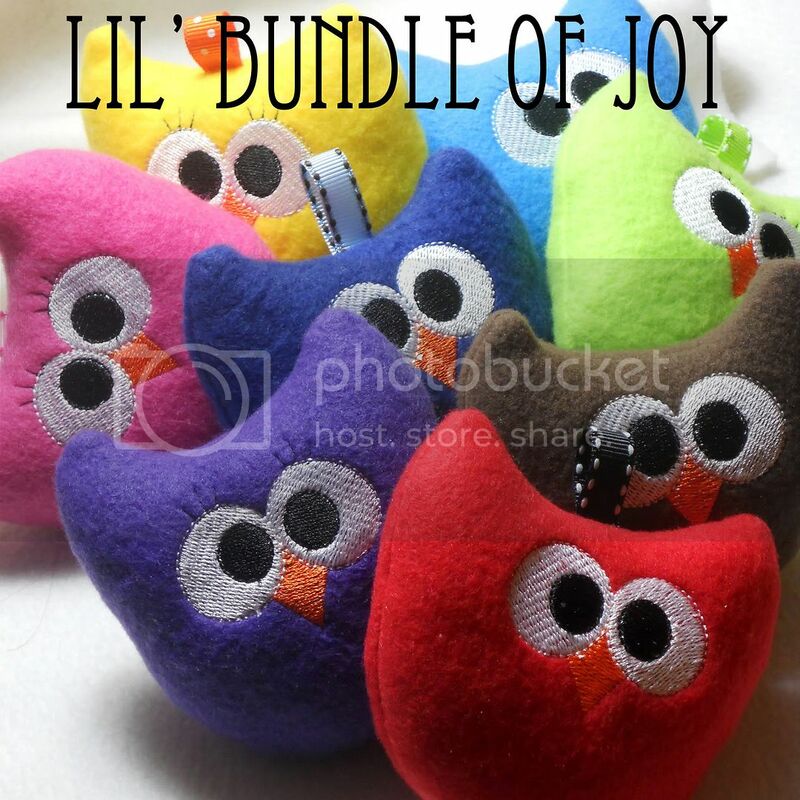 Malissa, at Lil Bundle of Joy, will be giving one of my lucky followers a crinkle & a plushie owl. The winner will choose boy or girl & the color of their choice. Entry instructions can be found below. Buy it now & receive 15% off using the code DOTCOM15 at Lil Bundle of Joy on Etsy! You MUST be following me publicly via GFC to win. Be sure to leave a separate comment for each entry along with your email address so I can contact you if you win. This giveaway will end on 6/19 at midnight CST. 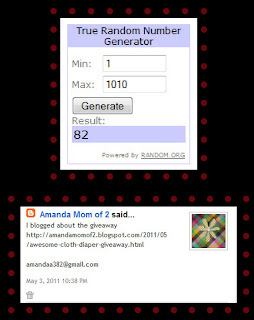 The winner will be drawn via random.org & will be notified by email. If the winner does not respond within 48 hours, a new winner will be drawn. This giveaway is open to all residents. The giveaway winner will be sent their prize free of charge. The review items were provided to me at no charge by the company. The review is my personal opinion of the products I was sent, & was in no way influenced by compensation of any sort. I feel so guilty. Especially because I know he's not quite ready for this, but Mommy can't handle all those teeth! I started weaning Eli a couple days ago. It all started during our trip because it was quicker to give him a bottle than to stop & breastfeed him. It would have added a few hours to our already 22 hour drive. I was still breastfeeding him in the morning, evening, & usually once when we stopped during the day, but my supply plummeted. After we made it to SC, I was breastfeeding as much as I could so my supply started to recover some, but then dropped again on the ride home. I probably would have worked harder to get it back up when we returned home if it hadn't been for all the biting! Eli now has 4 teeth. I could handle the biting when it was tooth against gum...but now that it's tooth on tooth, I'm not doing so well. Especially with all the bleeding. Yes, that's right, he has been biting me so hard I start bleeding, a lot. I'm still breastfeeding in the morning & at night. I will keep this up until my supply completely disappears. But I can tell he's upset when I come home for lunch or get off work & don't breastfeed him, the screaming & glaring gives it away. I made it 7 months, which is pretty good, but still 5 months short of the year I had planned on. I'm sure the guilt will subside eventually, but for now I feel like a terrible Mommy. Can I add a few extra hours to each day? Pretty please!? I have so much stuff to get done & caught up on after being on vacation for a week at work, home, & blog. I'm most excited about the blog stuff, because I LOVE giveaways & this next one is fun :) I think you will all really like it! I'm dreading all the cleaning, but am ready to no longer feel disgusted to look at my house. My husband, who doesn't believe in cleaning, was home alone all week, so my house is trashed. I'm estimating it will take a solid day with no interruptions to clean it all. Now to find a sitter for Eli, so Mommy can clean & get all the fun blog stuff done! So sorry I'm 2 days late posting this, we have had some awful weather the past couple days. Amanda Mom of 2! Congratulations Amanda!!! To be determined! The Rumparooz diaper giveaway ended at 8CST. However, due to very bad storms hitting, I will not be able to draw for the winner until sometime tomorrow. Sorry for the delay! Is this a wise idea with a 6 month old baby? I'm starting to get a little concerned...but it's too late to change my mind now! We leave for South Carolina on Wednesday morning. But I do need some pointers on keeping a baby happy when the majority of the day he will be in his carseat. I'm planning to take LOTS of toys to keep him entertained, but don't know much else to do. I have always thought road trips were fun. We even took a random road trip for our honeymoon. We flipped a quarter & headed in the direction it told us too, which ended up being California. I loved every minute of that, but this may be where I change my mind on road trips. Eli & I visited Sam & Stacey last Monday for a playdate. A very long overdue playdate. They hadn't seen each other since their newborn pictures in November (Sam is 2 days older). Not that they really interacted with each other, after all they we're less than 2 weeks old. But now that they are actually getting old enough to play, we need to be sure & keep it up. Here are some pictures of these adorable boys. Eli is on the left & Sam is on the right. Now, for those of you still reading, I need some suggestions. My baby HATES meat. We haven't tried much, but he ALWAYS spits it back out. I know I can't have a vegetarian baby, so I need pointers on how to get him to eat some meat too instead of only fruit & veggies! This seems like such an odd question because I know in a few years I will be begging for pointers on getting him to eat veggies.